12/01/2008 — Acquisition — Paris, Musée du Louvre — Some painters seem to make the headlines regularly, especially as concerns acquisitions or rediscoveries. Jacques Stella is one of them. Thus the Louvre has recently acquired a small copper painting exhibited in Lyon last year during the retrospective devoted to the artist. 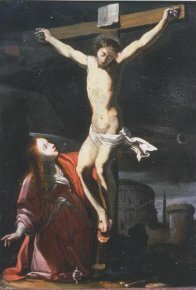 This Christ on the Cross and Mary Magdalene (ill.) which is particularly delicate, was previously unpublished. The work is signed and dated but the third digit is barely legible. It could be either 1625 or 1635. In the accompanying entry to the catalogue in Lyon, Sylvain Laveissière tends toward the first choice pointing out, and correctly so, the Caravaggesque influence of this copper seen through the prism of Carlo Saraceni. There are also remnants of the Mannerist style, especially in Christ’s elongated body, which would justify an early dating.